At Carpet Binding Services, We cater to contractors and businesses that have better things to do with their time than cutting and finishing carpets. Under normal conditions we can turn your work around in three days however, some work may required addition time for materials or shipping. Our goal is to turn around your carpet finish work as fast as possible. We take a great deal of pride in not only our precision finish work, but also our expedient service. Complete Carpet Binding and Carpet finish Services Available. Carpet Cove Base - great alternative to wood / vinyl baseboards. Cutting of Cove Base, Large area, Elevator Carpets, Hall Runners etc. Serging Service available on all types of carpets, including Orientals. More. Beautify and protect your stair case with bound carpet. Carpet chair rail protect walls regardless of what's on the floor. Wide Borders add Exquisite Beauty to any Room. 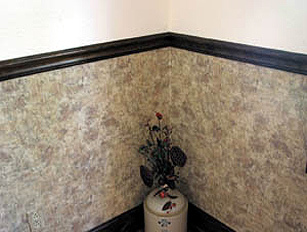 Wide Border Carpet Binding enhances the beauty of your area carpet. Carpet Binding Services is capable of serging all weights of carpet including Orientals. We provide a gorgeous wrap around serge while simultaneously applying a tape underlay. The tape underlay is vital as it never allows carpet pile to bust through and also eliminates the need to bevel. 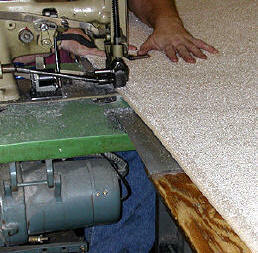 Carpet Binding Services is equipped with heavy duty serging machines. Specifically designed for use on carpets. 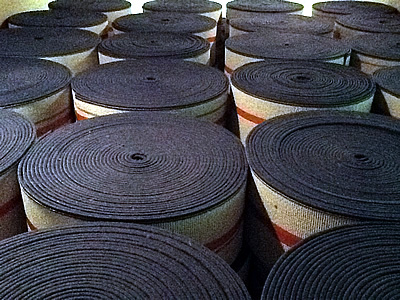 Carpet Binding Services provides a wide range of yarns in stock to match your carpet. Special yarns can be ordered upon request. Carpet Binding Services Provides Fringing for the ends of carpet runners or area rugs which will enhance their beauty and compliment many decorating schemes. The carpet edges are bound first then the fringe is applied to the carpet. 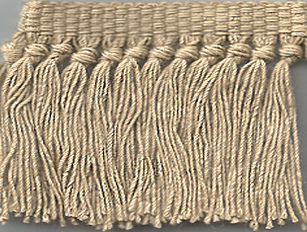 Standard Karastan™ fringe is stocked for fringing carpets. Many custom styles and colors are available by express delivery. We are capable of fringing area rugs and shapes such as circles and ovals. CARPET STAIR TREADS is another application for commercial space. The treads are typically larger than cove base (12" or larger) and are bound on all sides. Stair treads protect the stepping area without covering the entire surface. 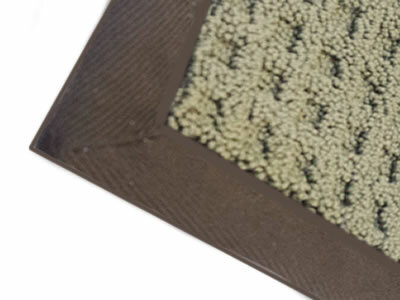 CARPET STAIR TREADS can be manufactured from any carpet, regardless of what's on the floor. However, commercial, or cut-pile, carpet with a pattern or print is most attractive. Treads can be manufactured to any size required. CARPET STAIR TREADS are priced by the linear foot of binding and/or cutting. Please contact us for further details. At Carpet Binding Services, The edges of custom rugs/carpets can be treated with several attractive options, one of them is binding. Binding comes in hundreds of colors to match the carpeting. They are pressure-dyed to resist fading, and are stain-resistant. Binding not only enhances the beauty of the carpet but will eliminate frayed edges thereby extending the life of your carpet. 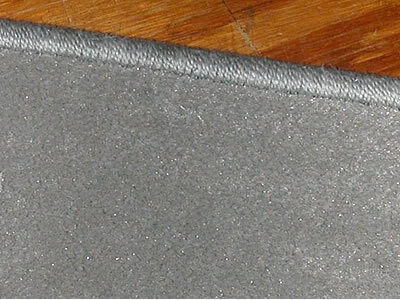 The standard binding used to match carpeting (over 200 colors in stock) is 7/8 inch wide synthetic tape. Custom ordered wide canvas binding is also available at by special order. If you are a carpet dealer you already know that a satisfied customer is the best form of advertising. Repeat business is the lifeline in the carpet industry. With this in mind, and with so many more dealers vying for the same customers you need to offer more for less. 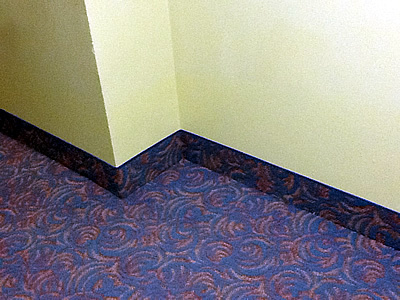 Carpet binding is an inexpensive and valuable add-on to make your customer feel good about doing business with you. Whether it be binding area rugs, room size carpets, runners or making something of the scraps left from a job, your customer will appreciate the extra service you are offering. At Carpet Binding Services, Carpet cove base is often specified by customers and designers in commercial and residential carpet installations. CBS cuts, binds and delivers carpet cove base to contractors and retail stores in the entire Washington, Maryland and Virginia area. Carpet Binding Services, receives and cuts carpets to your specifications. CARPET CHAIR RAIL is another application for commercial space. The strips are typically larger than cove base (6" or larger) and are bound on top and bottom edges. Carpet chair rail is typically used in office space, restaurants and in meeting facilities, where chair backs might mar walls. Carpet chair rail can be manufactured from any carpet, regardless of what's on the floor. However, commercial, or cut-pile, carpet with a pattern or print is most attractive. Strips can be manufactured to any width. Carpet chair rail is priced by the linear foot of binding and/or cutting. Please contact us for further details. Wide Border Carpet Binding enhances the beauty of your area carpet. Carpet Binding Services is capable of binding all weights of carpet. and stocks a wide range of colors to match your carpet. Special binding tapes can be ordered upon request. 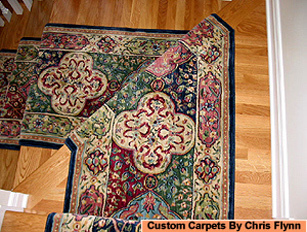 Carpet Binding Services is a Family owned & operated workroom. It's our aim to provide the industry's best work at an affordable rate. We perform our custom border work with the world's finest machinery & tools from NC Carpet Binding & Equipment. We are a high volume carpet & area rug fabrication workroom that performs jobs nationwide. If you have 1 rug or 1,000,000 to fabricate, Carpet Binding Services is capable of providing immediate, reliable service. Whether the job is for a few hundred feet or several thousand feet of carpet base they are able to meet customers due dates for installation when planned for in advance. Rush orders are handled on a case-by-case basis. 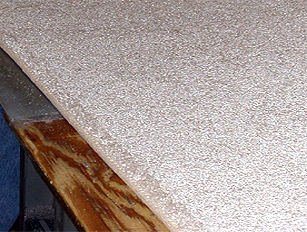 Carpet Binding Services is also capable of cutting and binding uni-bond (hot melt backing) carpet base. Carpet Binding Services, receives and cuts carpets to your specifications for Cove Base, Elevator Carpets, Carpet Hall Runners, Carpet Stair Runners or Treads, Area Size carpets (i.e 6x9, 9x12, 12x15), Cut to Size Requirements, Circles, Ovals, Octagons etc. Carpet Binding Services Tel. 301-773-1334 MD VA DC / Al's Binding service in Maryland District of Columbia & Virginia for Binding, Carpet Binding, Carpet Serging, Carpet Fringe, Carpet Services, Work Room Services, Carpet Cove Base, Cove Base, Maryland, MD, Washington DC, DC, Virginia, VA, New York, NY, New Jersey, NJ, DE, NC. Carpet Binding Services is a dedicated warehouse operation equipped with industrial equip that applies edging to carpets. Carpet Binding Services offers free pick-up and delivery in the Baltimore-Washington Metropolitan Area. Carpets are delivered back to your location within 3-7 days of pick-up. Call for a pick-up and delivery schedule. In addition to local Carpet Binding Services, we service customers from Flooring contractors, Carpet Installers and retail stores NATION-WIDE Our shipping department will receive your carpets direct from the manufacturer for those custom ordered carpets we will be finishing for you. Major carpet manufactures and flooring contractors for hospitals, hotels, casino's, banquet hall or any large facility where linear are an issue. can handle any job requirement from one small local area run to 10,000+ feet of custom carpet base.